• Added support for repeating to-dos inside projects. • Upgraded the sync schema to support repeating to-dos inside projects. PLEASE NOTE: All devices must be upgraded to the latest version to continue syncing. • Some improvements for the Natural Language Date Parser (including support for Japanese). • Added a new warning that items will be deleted from Reminders when importing from Reminders for the first time. • Fixed an issue when opening file links added to a to-do’s notes via Quick Entry with Autofill. • Fixed a crash on macOS 10.11 when switching to a project which had a deadline set. • Fixed a crash on macOS 10.13 when closing windows. 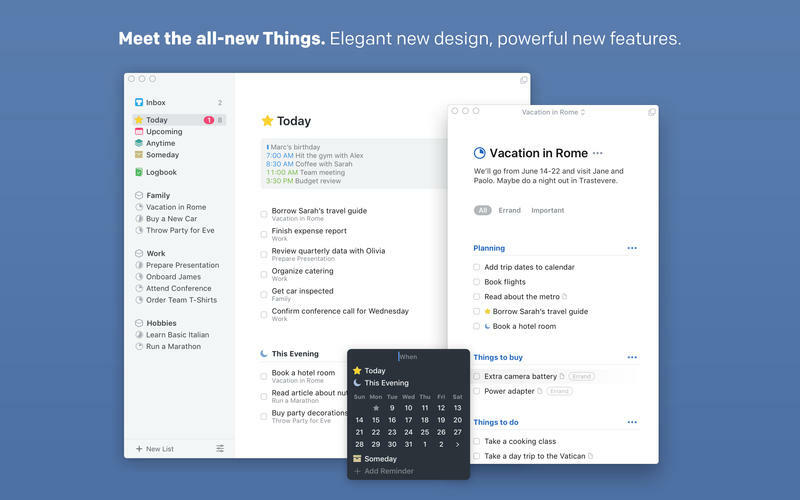 How it looks, how it works, and how it feels – Things has been completely redesigned, with more clarity, improved workflows, better structure, and delightful animations. It’s a to-do list like no other. It’s so much easier to handle your projects now that you can break them up with headings. 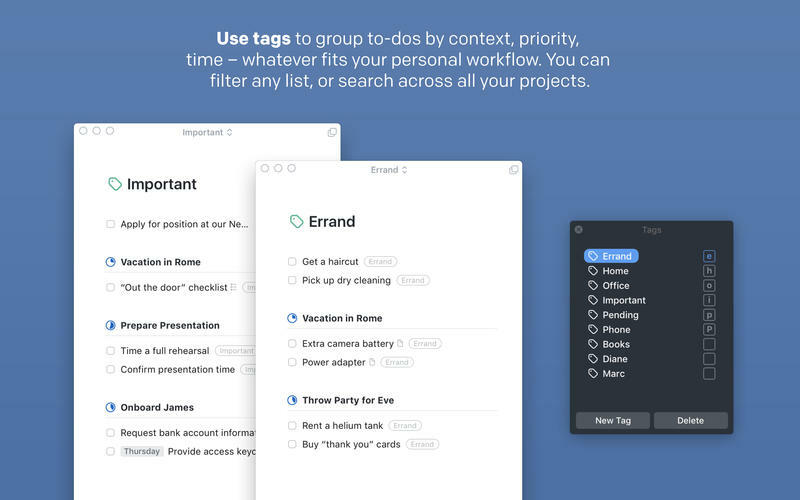 Use them to create categories, milestones, or whatever you need – just give each one a name and drag your to-dos underneath. Instantly you’ve got a nice, clean structure for your list, and the plan becomes perfectly clear. Some things take several steps to complete but don’t require a full-blown project. 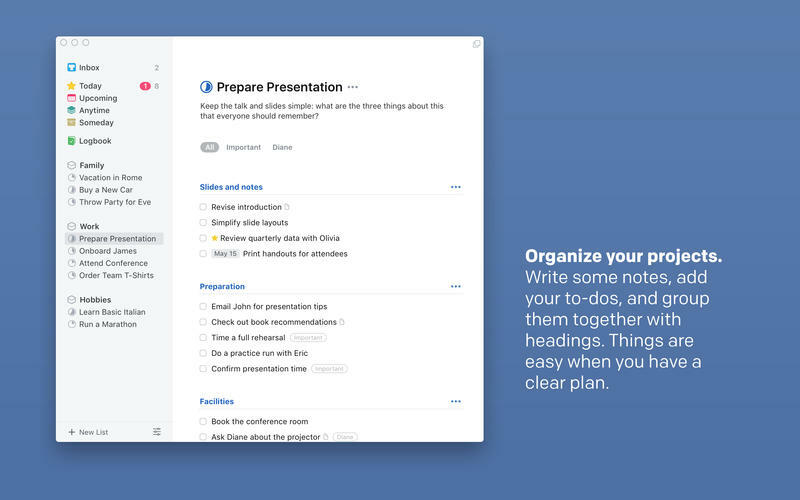 Now you can use Checklists to break down the finer details of a to-do. Use them for shopping lists, when packing your bag for a trip, or to detail a process at work so you won’t miss a critical step. Display calendar events alongside your to-dos and stay on top of your schedule. They will show at the top of your Today list, and for each day in Upcoming, where you plan the week ahead. Once you’ve made your plan, the Today list is your go-to place for all daily activities. Calendar events now display at the top, giving an outline of your schedule. Your to-dos follow, with a discrete section at the bottom called This Evening for things you’ll get to later in the day. Plan your week ahead with the new Upcoming list. It shows everything on your agenda for the coming days: scheduled to-dos, repeating to-dos, deadlines, and calendar events. A quick peek at this list is all it takes to stay on top of your schedule. Working with dates is super easy with the new Jump Start date selector. 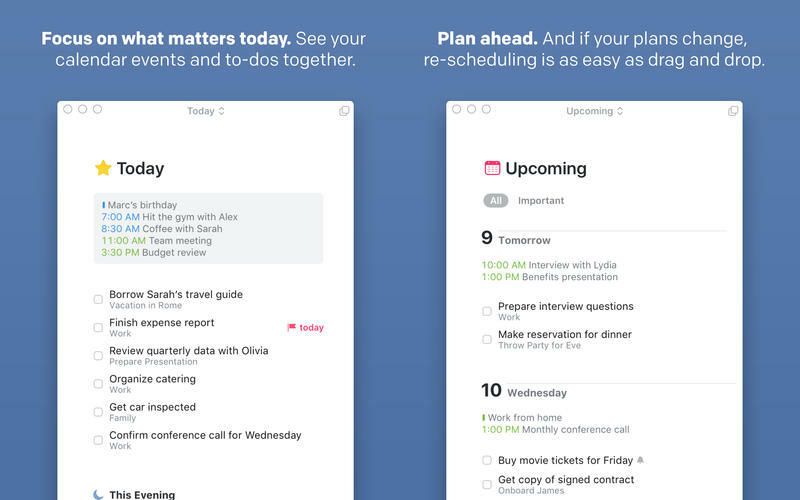 Use it to quickly put to-dos in your Today list, schedule them for later, or put them on hold in Someday. Jump Start has a magical ingredient: Natural Language Recognition. It smartly detects what you’re typing to work out what you mean... “Tom(orrow)”, “Sat(urday)”, “in fou(r days)”, “Au(gust 1)”. As you can see, it jumps to all the right conclusions. One of Things’ most-requested features is now here: time-based reminders! You can add a reminder by typing (natural language recognition), or just speak to Siri. For those to-dos you absolutely cannot miss, reminders will give you peace of mind. Search and navigation in Things is now extremely fast, with Type Travel. All you need to do is start typing – the name of a list, to-do, or tag – and instantly you’re taken there. It’s magic! 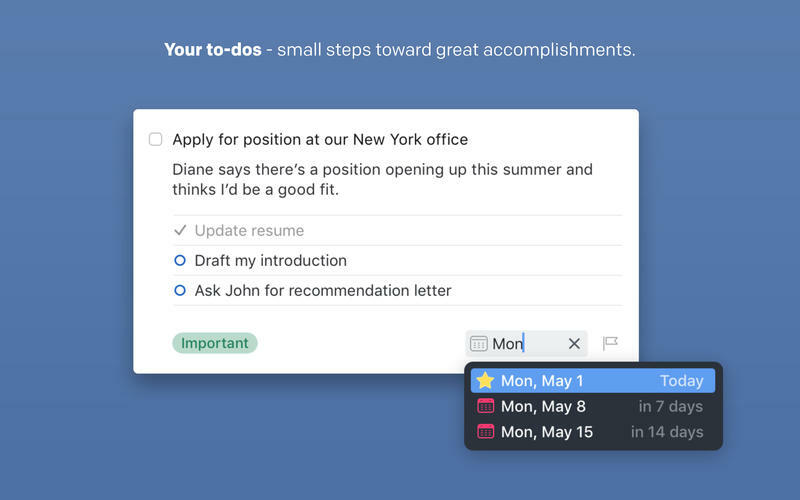 Collapse your sidebar with a two-finger swipe to cut out distractions and focus on your work. This is great when you’re working in Split View, or if you just need more room on your screen. You can now open multiple projects in their own windows and drag to-dos back and forth between them to organize with ease. Or use them across multiple displays, desktop spaces, or split views  – whatever suits your personal workflow.